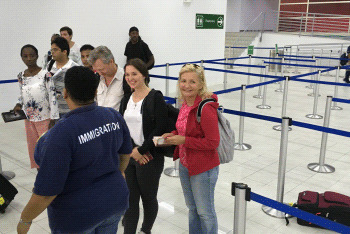 SIMPSON BAY, St. Maarten (Tuesday, December 11, 2018) - Passengers on board a WINAIR flight from Saba that landed at 7:56AM on Tuesday, December 11, 2018 were the first to make use of the Arrival Hall at the Terminal Building of the Princess Juliana International Airport since the building was severely damaged by Hurricane Irma on September 6, 2017. This serves as a part of the Package One - Temporary Operations of the Princess Juliana International Airport (SXM). They were followed by passengers aboard two other WINAIR flights from St. Eustatius that landed back to back at 8:12am and 8:14am respectively. The return to the Terminal Building followed the successful testing after the transfer of Arrival operations was carried out on Monday, December 10, 2018. The Managing Board has also confirmed that Departure operations will also be transferred back to the Terminal Building on Thursday, December 13th, 2018. Once this is done, the Temporary Arrival and Departure Pavilions will be dismantled on December 15th, 2018. Passengers on board Divi Divi airline, which made its inaugural flight to St. Maarten on Monday, will be processed in the Arrival Hall when they land at 12:30pm today as will those arriving on JetBlue at 1:28pm and on KLM at 1:45pm. “I have nothing but admiration and respect for the tireless work done by each and every member of our staff who have made it possible for this giant step forward that we have taken today,” said Acting CEO and CFO, Ravi Daryanani, while Chief Operations Officer, Michel Hyman added that “this was a very important step in our recovery and reconstruction process. Additionally, the staff are the true heroes of this accomplishment.” The official ceremony marking the return to the Terminal Building will be held on Tuesday, December 18th, 2018 which will also kick off the 75th anniversary celebrations of the airport.